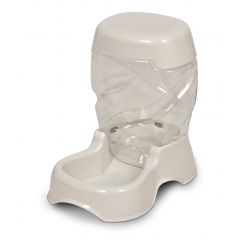 The Petmate® Pet Café Waterer simplifies your life while enhancing the life of your pet. Featuring an automatic gravity design that keeps your pet hydrated by replenishing your pet’s water supply. The eco-friendly water hopper automatically fills the water reservoir when levels get low and features a large water dispensing hole making the bottle easy-to-clean. The Pet Café’s fashionable base features easy-grab cutouts making the Waterer easy to maneuver and comes in a variety of colors to complement any home decor. Constructed using more environmentally sustainable PET vs. PVC bottles. Pet parents choose from an assortment of sizes. Made in the USA. PRODUCT NOTE: The Pet Cafe Base and Bottle IS NOT dishwasher safe.